Spotted on etsy, with the darling note — “chippy but cute.” $5 from vintagebutterfly94. Love it! Reminds me of Dolly Parton. 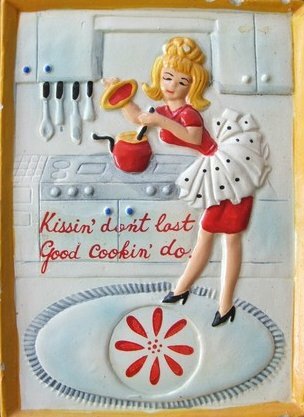 We had that saying in our kitchen too when I was a kid. It wasn’t as racy as the one shown here. Ours was on a wooden plate with a sort of Pennsylvania Dutch motif. Wonder what ever happened to it? Hmmm….must go spelunking in the basement next time I am back at the folks’. We had one also, it was kind of like a black iron trivet that hung on the wall with this saying on it. Was on the wall for decades.